Really good anime – for that matter, really good movies, television, books, etc. – have really good fights! They also have other things (plot, characters, themes, background, etc. ), and the genre of any given story may limit the fighting, but let’s be honest… an integral part of man’s design is that he can leave the cave, find the food, hit the food on the head until it stops moving, and drag the food back to the cave, possibly hitting other things on the head as well, when they try to steal the food. We are physical creatures, and physical prowess is part of how we have always survived. Thus, even and perhaps most especially in our modern age, where not every conflict comes to blows, fight scenes rock! …ok, I amend that: proper fight scenes rock! 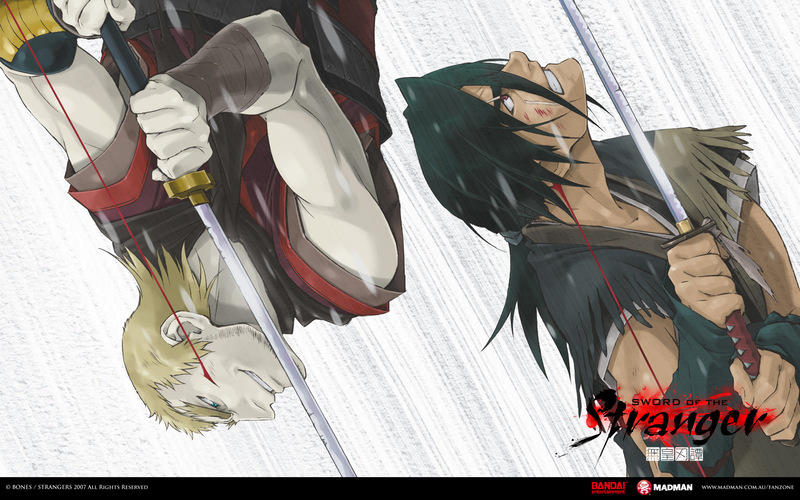 From the movie Sword of the Stranger, the sword fight between Nanashi and Luo-Lang. Not that there’s anything wrong with “flash,” as a number of my favorite fights feature quite a lot of it, but this fight is all “substance.” I love how unvarnished it is. No magic, no fancy gimmicks, no superpowers, no screaming battle cries (at least, not constantly), no shouted technique names, not even any guns. Don’t get me wrong, all of those are, or can be, great, and when used properly, they enhance the story and its impact on the audience. But this is just a a pure, physical contest between two remarkable swordsmen, combining elegant skill with brutal, primal savagery. And speaking of “unvarnished,” so are the two combatants, at least in their motivations for this fight. Throughout the movie, we have people fighting for this reason or that reason. Some are supposedly noble, such as one group striving to fulfill the duty given them by their emperor, though there is at least one which is a traitor-in-waiting. Others are far more base, such as one character’s ambition, or another exchanging his service for the promised reward of a princess he has much desired. Yet, for all these reasons, this final, climactic fight boils down to the two men, the last survivors of a battle: Nanashi wants to save a life while Luo-Lang just wants to fight. Perhaps that’s doing Luo-Lang an injustice. He wants to feel the thrill of fighting a worthy opponent. It’s his drug of choice, and one he has not often experienced. He wants to feel alive. It’s all the more poetic, then, that Nanashi teaches him not to rely on a drug to dull his pain, which he and his fellows have been using in battle up until this point. Nanashi understands that his pain, and he has felt much of it, is proof of life. So Luo-Lang casts the physical drug aside, stepping on it, but he still indulges his other addiction. As skilled as he is, he suffers from a lack of inhibitions. He wants something, he takes it, and he wants this fight with Nanashi. So, simplified again, Luo-Lang is the epitome of unrestrained “I want,” while Nanashi has made a deliberate choice to give his all protecting someone else. There’s is a struggle so basic and elemental that it resonates with the audience without any sort of gimmick attached. Not to say they don’t make a proper show of it! The swelling music is powerful, balanced with simple, potent sound effects. The animation is fluid, showing us how fast these two swordsmen are moving, while letting us easily follow what’s happening. It doesn’t cut and cut and cut, just to make things look good. We see the entire fight. And the attention to detail is riveting! Right down to Nanashi’s breath fogging on the steel of a blade! This is not a face you want Nanashi making at you. Throughout this fight, and the battle immediately preceding it, we can see the two warriors in the full of their strength and skill, their speed and agility, their precision and tenacity. They use the environment around them to their advantage, they move all over the place, they never waste a movement, they exchange wounds (believable wounds, for that matter)… In short, it’s just an excellent fight! Nanashi is cut in the side with his own blade, and the movie’s final scene suggests that he dies from his wounds, but not before saving the life he fought so hard for… and not before ramming Luo-Lang’s own blade straight into his chest. Luo-Lang’s last words indicate that no enemy has ever cut him like that before, and the pain is strange. Small wonder he was so inhuman as to get off on fighting. He didn’t even know the human experience of pain. But Nanashi did, and that, too was the difference between them. Nanashi may have died from that fight, but he died victorious, his enemy slain and denied the prize, his mission completed… his soul redeemed. And that’s the thing about fighting. Done right, it’s both a risk, even an acceptance, of death, laying down one’s life for the right cause, and it’s the fight to remain, to live, to keep fighting and serving, to never give up. Whether or not one lives or dies, in the end, is unimportant. We all die. What matters is what we do while we’re alive, and the state of our soul when we go. So, whether or not Nanashi really died is irrelevant. His soul was ready. That’s what counts. I say again: an excellent fight! 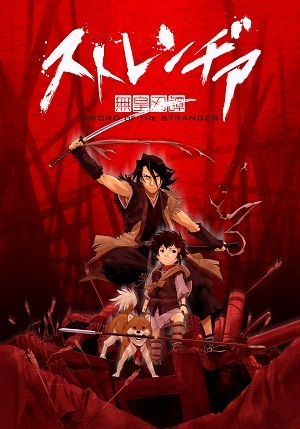 This entry was posted in 30-Day Anime Challenge, Anime and Cartoons, Challenge Accepted and tagged Sword of the Stranger. Bookmark the permalink.